Calm, humid evenings drive smallmouths to the shallows at night. 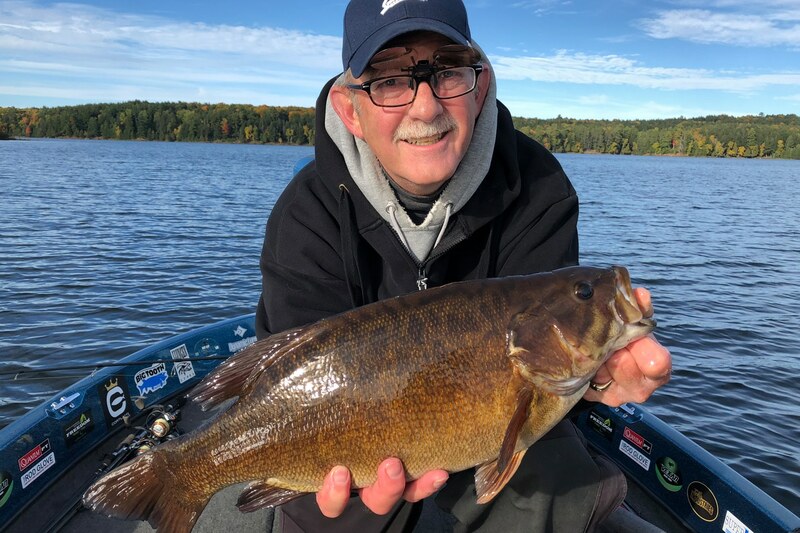 The best smallmouth fishing of fall is had when you camp out on lakes and over smallmouth wintering holes throughout the midday hours. Mark Benson took advantage of this window of opportunity while fishing with the author. Peak May smallmouth fishing revolves around sunlight and water temperature. Many spring smallmouths are caught during midday hours and afternoons on bright, windless, sunny days. From mid July through August, prioritize evening and nighttime fishing This is the easiest and most productive time of year for targeting smallmouths on lakes where rusty crayfish is the primary forage species. 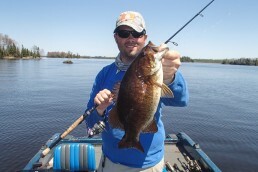 Andrew Ragas with his personal best smallmouth of 7 pounds, 8 ounces, captured during a prime spring window. Big smallmouth bass are wise creatures that have been around the block several times before. Most 20-inch bass we catch and release from the inland lakes of northern Wisconsin are irreplaceable, 20-year-old fish. They are the most valuable members of the population. Some of these fish are caught and released multiple times throughout a single season. Catching and releasing these trophies now requires more tact and planning than ever before. Our cold, fertile waters with a 6-month growing season enables big smallmouths to live long, prosperous lifetimes. In recent WDNR surveys, some of the oldest smallmouth bass on record have been aged between 25 to 28 years old. With age comes lots of experience and lure rejections. On a typical inland Wisconsin lake, a 20-year-old smallmouth has seen hundreds of different lures. She has also been caught, handled and released at least once or twice annually. To continue being caught, that fish will have to be fooled by anglers with new bags of tricks. Not just presentational, but by schemes such as taking advantage of unique windows, scenarios, and peak periods in order to actually be able to catch them. As a northern Wisconsin bass-fishing guide, the trophy smallmouth bass knowledge I employ and share with to others was not acquired overnight. The thousands of hours I have invested and accumulated on the water have enabled me to identify windows and peak periods for every season and, in some cases, each week of every month. I have also been able to identify peak periods and unique windows for every specific lake I fish—only fishing them during those periods! This systemic identification of anticipating the best fishing odds and opportunities has resulted in superior results and good fishing daily. The patterns can repeat themselves annually. Today, all of the bass-fishing trips I plan for and schedule revolve entirely around seasonal windows and peak periods for my fishing region and its specific waters. It’s an advantage I have over all smallmouth fisheries, and every other bass angler I share the water with. Simply put, catching big smallmouths won’t be as consistent or successful without prioritizing your precious fishing time around windows and peak periods. These occurrences happen seasonally, monthly, weekly, and daily. Our spring fishing season is a 6-week period lasting from May season opener through the end of spawn in mid June. The best time for spring smallmouths is during the second and third weeks of May. During the spring season, all fish locations are shallow. Nearly all fishing is casting specific regions of the lake and locations that are less than 10 feet deep. All fish movements in spring are deep-to-shallow structural and spawning migrations. 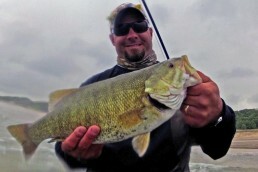 As waters warm, smallmouths wake up from their main-lake wintering areas. They follow main-lake breaklines and topography, then infiltrate the shallows seeking spawning locations. This movement lasts from ice out through spawn, and is dependent entirely on the conditions. Peak smallmouth fishing during May revolves around sunlight and water temperature. If you look at the hundreds of spring smallmouth photos I’ve shot, nearly all of them were caught during bright, sunny days. Besides sunlight, optimal water temperature for best feeding and activity is 48 to 55 degrees. This is a product of the warming days and comfortable southern and western winds the season delivers. The spawn officially begins during May’s full moon. This is a peak period for targeting large female fish. One of the most underrated peak periods of spring is patterning baitfish migrations. Shiners and log perch school and roam heavily in the shallows for their own spawning requirements. 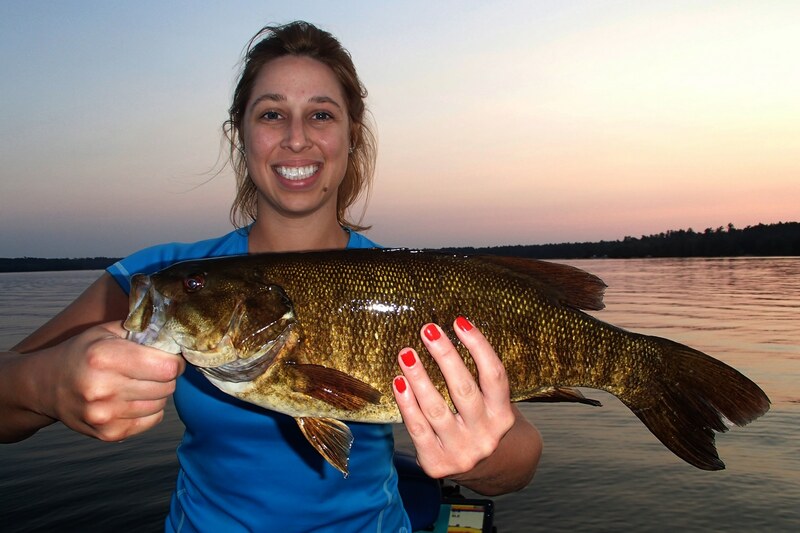 Smallmouths follow and feed on what’s most readily available. Fish the smaller, shallower warmer waters early in spring. Then move on to larger, deep and clear waters later on. This assures you of fishing ahead of, or behind, the spawn. To catch the biggest smallmouth of spring, camp out on lakes during midday and afternoon hours. Understand that a productive smallmouth fishery will have 5 to 10 (or more) primary staging and spawning regions. Focus all angling efforts around these areas only, to avoid fishing worthless, unproductive water. A good staging location can hold 15 to 50 catchable bass until fish have become conditioned. It’s why camping out on spots is so important. Any weather or wind change will trigger activity. Large, adult bass will reuse the same staging and spawning locations annually unless they have been displaced or exploited by other anglers. Prioritize your fishing around the second and third weeks of May. Weather is most predictable, the days become sunny and warmer, catch rates are the best and biggest of the season and water temperatures are optimal. This brief window of May always delivers the best smallmouth fishing of spring. It’s when I prioritize my spring trips. Mid June through Labor Day weekend is the summer season. This long period encompasses everything from the heavy feeding post-spawn phase of mid to late June, July’s summer peak, and August dog days of summer. There is no bad time to catch big smallmouths in midsummer, but the best and most advantageous in my book has played out in late June, late July, and early August when most fish activity resulting from windows and peak periods takes place. To catch big smallmouths the entire tackle box opens up. The presentations of most smallmouth fisheries will cater best to crayfish patterns, perch patterns, cisco patterns or all of the above. In summer, we’re fishing at all depths—deep by day, and shallow at night. Following spawn, fish disperse throughout the lake, progressing from shallow to deep, then settling in structure as deep as 15 feet such as flats and points, fish cribs, wood, rocks and boulders, and weedlines. Deep structure to whatever depth the lake’s thermocline dictates (if the lake stratifies) may then consist of mid-lake rock bars and humps, deep rock structure, boulders, ledges, main-lake basins, sand grass, and open water. In most smallmouth fisheries, there are shallow-water residents and deep-water residents that relate to structure and habitat, and some open-water roamers that only feed and follow pelagic baitfish such as cisco and smelt for the remainder of the year. Summer peak sets in at 75-degree water temperature. Thermoclines fully develop. The largest bass will be holding in deeper, cooler water. The food is everywhere. Likewise, weather is the best it will be for the entire year. Feeding windows are long and predictable, influenced and aided by weather and lunar phases, repetitive daily. Lake hopping enables us to stay most productive and helps maximize bites. High-pressure weather systems filled with heat make for challenging times and oppressive midday fishing efforts. Fish early or late to counter them. From mid-July through August, I prioritize evening and nighttime fishing efforts. The after-dark heavy feeding and molting of crayfish in the shallows and bug hatches trigger feeding binges of big bass. This is the easiest and most productive time of year for targeting smallmouths on lakes where rusty crayfish is the primary forage species. Speaking of big bug hatches, the mayfly hatch wreaks havoc for all anglers. But late June through mid-July, it actually improves smallmouth fishing, making big bass easier to locate and catch with hair jigs and surface lures. Strangely, most anglers will never take advantage of this phenomenon. To stay on top of big bass and big bites throughout summer, fish the deepest and clearest lakes. These will remain cool throughout the season, catering best to trophy smallmouth. Summer heat cannot penetrate through them as effectively and detrimentally as it does to flowages and dark-water lakes at this time of year. Midsummer cold fronts and cooldowns that follows oppressive heat activate feeding, re-energizing members of the smallmouth population that might have become dormant due to warm water. As summer progresses to fall, prioritize most fishing strategies onboard and offshore. Don’t be a bank beater. Most big bass, by now, are living deep around the structure of main-lake basins. Fall in the Northwoods is short. We sometimes get only a week or two of transition time between the seasons. 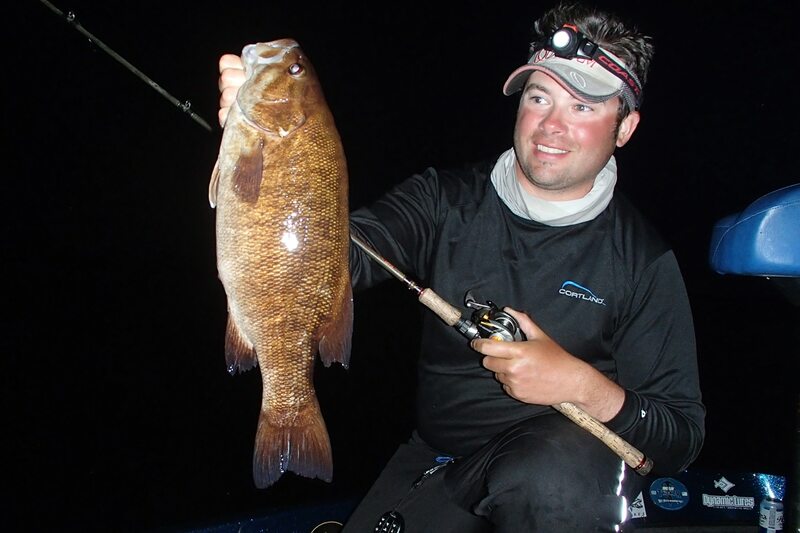 Fall smallmouth fishing is patterned by the stages of turnover. Fishing locations revolve around wintering migrations. By now, 90 percent of the entire lake’s bass population is living in 10 percent of the lake, in and around wintering locations. The best peak period of autumn will be when fish have moved into wintering areas, making them easier to locate and catch. Location must always be prioritized over presentation and strategy in order to experience best fishing. A productive smallmouth fishery will have upwards of five or more main overwintering areas. Wintering holes aren’t specific spots, but pre-determined survival locations that have been identified and utilized by previous generations and current members of the lake’s bass population. The locations are historical to the lake’s bass fishery because they get visited annually by the same community of bass and an individual fish during its entire lifetime. They’re optimal deep basin and structural sweet spot locations that a community of bass finds and settles on for overwintering protection and comfort. The substrates may consist of deep rock and bottom transitions, holes, sand grass, and all are commonly in 25- to 30 foot-depths. September is a transition month highlighted by cold fronts and Indian summer that delivers a brief shallow-water feeding movement, typical for end of month. Autumn cold fronts trigger feeding, but windows are short and rapid. Midday fishing efforts and sunny afternoons are prioritized during the cold-water, post-turnover period in October and November. By now, all bites for the boat are big fish or bust. 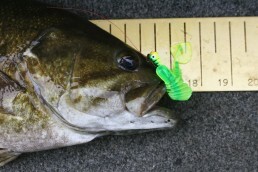 Smallmouths are schooling heavily and vulnerable. Offshore deep-structure jigging, rigging and casting is catching them from depths commonly at 25 to 30 feet. The tackle box closes and fewer presentations will be utilized and needed by the time first ice approaches. From mid-September through November, baitfish migrations are prevalent and offer the best feeding windows. When waters cool into the 60s in September, schools of yellow perch invade remaining green weedlines. This is one of the reasons why big smallmouths slide up towards the shallows again. In addition to perch migrations, ciscoes and whitefish spawn during November’s full moon when waters are in the low to mid 40s. Didn’t think trophy smallmouth were catchable at this time? On cisco fisheries, the placement of some smallmouth wintering locations correlates with cisco spawning sites, and are often strategically within close range to them. Giant smallmouths are experts at ambushing and feeding on these open-water delicacies. They will set up nearby for an easy meal during the cisco spawn when cisco are staging at 20- to 25-foot depths during daytime. Fall smallmouth fishing the coldwater period is to be done slowly and meticulously. It’s no longer necessary or wise strategy to cover water and fish many different lakes in a single day in order to experience the best fishing. The best fishing of fall is had when you camp out on lakes and over smallmouth wintering holes. Schedule all fall bass trips before or after turnover. Lake smallmouth are deep structurally oriented fish. Turnover can be avoided completely and countered by fishing flowages, rivers, and lakes that didn’t stratify. For fishing consistency and success, plan fishing trips around some of these windows and peak periods. Advantages offered to you by weather, conditions, environment, water temps, forage are your gateway to a fishing trip victory.